Karen House : Oct. 16, 2017, 3:39 p.m.
View of Sequatchie Valley, by Chuck Sutherland. Used by permission. Oct. 16, 2107 – What is your vision for the community you call home? That is the question local officials, landscape architects, and planners asked area residents last week. In a series of public meetings organized by Farmer / Morgan, public input was encouraged in two categories: Development of the Valley Fest property in Dunlap and the future of tourism in Sequatchie and Bledsoe counties. Farmer / Morgan is a design firm frequently used by the City of Dunlap to draw up plans for improvements in the city, and they were employed to organize the meetings and produce conceptual drawings that visualize the ideas that people came up with at the meetings. Will Hargrove, associate project designer with Farmer / Morgan, presents a drawing of a possible entrance-way to the Valley Fest property. The first two meetings – Monday and Tuesday, Oct. 9-10 – dealt with the future of the 17-acre Valley Fest property in Dunlap. 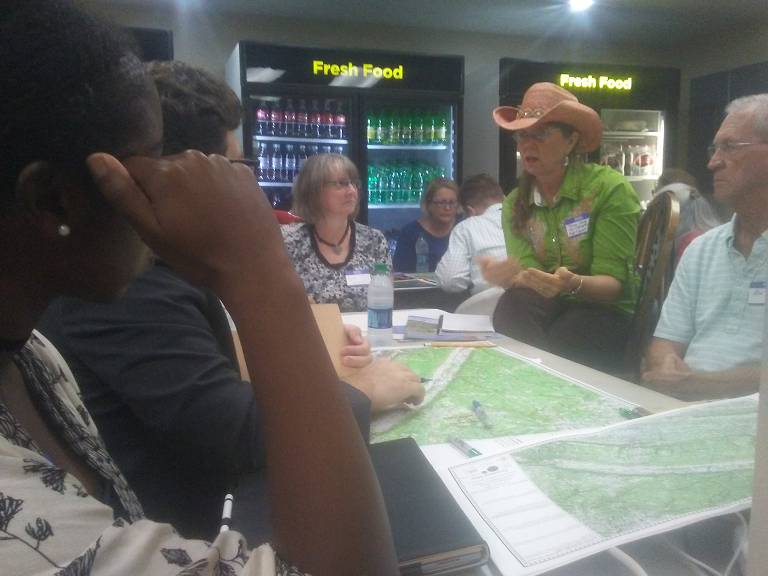 The open meeting at First Baptist Church Monday gave people the opportunity to make suggestions and brainstorm about what they would like to see, in the future, on that property. A pond on the back side of the property. Re-purpose the old railroad trestle over Coops Creek as a bridge connecting the Valley Fest property to Coops Creek Trail. A multi-purpose civic center built on the Pine Street side of the property that could seat 2,500 people. Multi-purpose sports fields, basketball courts, etc. Additional walking trails around the property. A large, open entrance-way at the corner of Pine and Wagner streets that would include restrooms. Parking for about 200 vehicles. 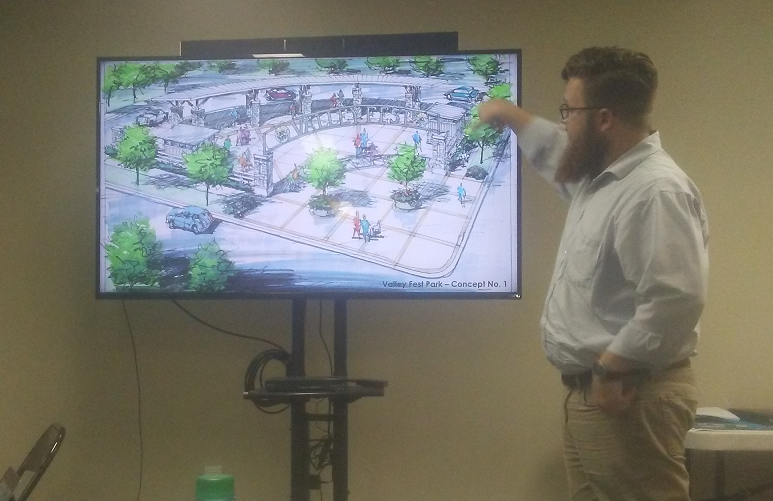 Benjamin Farmer, principal managing partner for Farmer / Morgan, suggested that the annual Valley Fest celebration easily could be moved to Harris Park, and the property it now uses could be redeveloped into any of the ideas discussed at the two meetings. The second series of meetings, following on the heels of the first round, addressed the development of tourism in the Sequatchie Valley. For three days, Oct. 11-13, Farmer / Morgan moderated meetings at Mt. Airy Golf Course to identify tourism assets in Sequatchie and Bledsoe counties, and to outline several different plans for utilizing those assets to draw more tourists to the valley. Six categories of tourism were examined: Scenic, natural, historic, cultural, archaeological, and recreational. Pointing to 2016 statistics that show Bledsoe County at #92 out of 95 counties in the state, as far as tourism income, and Sequatchie County #86, Farmer stated that there is lots of room for growth in local area tourism. Some of the assets that attendees identified for the valley included the river, the scenic beauty, the mountains, and many outdoor activities like hiking, kayaking, rappelling, hang-gliding, and horseback riding. Developing more accessibility to the river, like launch points for canoes and kayaks. Building trails to connect to the Cumberland Trail, which will eventually extend from Chattanooga to Kentucky, just east of the valley. Draw up an illustrated map that would highlight interesting points for visitors – like the Coke Ovens Park, the Tree Toppers hang-gliding ramp, bed-and-breakfasts at Pikeville, Amish communities, etc. Attract more restaurants, motels, and rental cabins to accommodate an increase in tourism. Widen US 127 from Dunlap to Pikeville. Attendees at the public meeting discuss how to improve tourism assets in the Sequatchie Valley. 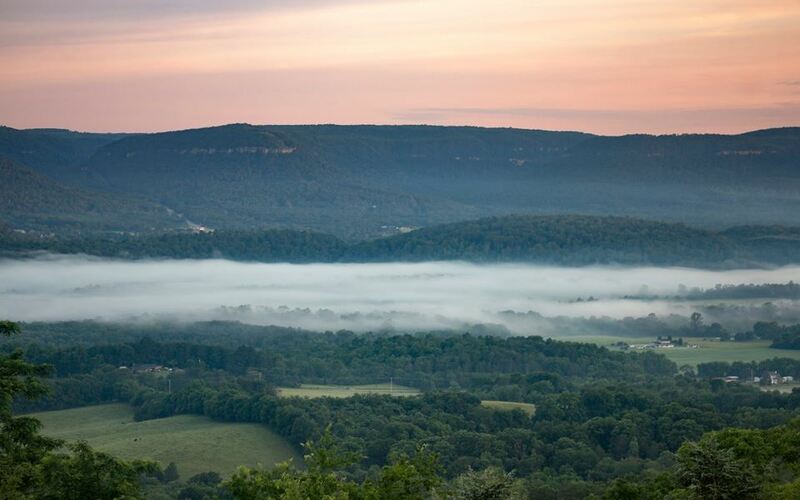 Farmer and his associates pointed out that state and federal funds are more readily available when communities work together on projects, which is why they examined the development of tourism for the Sequatchie Valley as a whole, rather than just in one county. The Valley Fest meetings were financed with a $10,000 grant through the Tennessee Department of Health, and the Tourism Enhancement meetings were financed with a $10,000 grant through the South East Tennessee Development District (SETD). Soliciting public input for development plans is a first step in securing state funds to develop these assets.